Needy: She's only hovering. It's not that impressive. Jennifer: Do you have to undermine everything I do? One of the marks of incredible power is the ability to levitate in the air without any apparent means of doing so. Floating is a favorite pastime for many different character types among many different genres. Witches, wizards, and psychic types can levitate or fly as a spell. Supernaturals of various stripes, like vampires, ghosts, angels, etc. also enjoy floating. Vampires in particular, like to use it in a Pivotal Wake-up. Heroes and villains (especially in video games) often learn to float and levitate after going into their Super Mode as their powerup gives them the ability to defy gravity. Even inanimate objects can get in on the action, as the Mineral MacGuffin, Cosmic Keystone, or any shiny object of power will often be found be floating over a pedestal draped in light. Generally, this is seen as badass and dangerous (on par with Unstoppable Rage) because it's far less natural than outright flight. Even though the floating itself is usually harmless, it can really freak enemies out because it implies the floater is capable of much more powerful feats. In short that he is defying physics just enough to float because it's cool, but with more hurt hidden up their sleeves just waiting to come out. Power Gives You Wings is a Sub-Trope, where sufficiently powerful beings gain the ability to sprout wings as opposed to just floating on their own. Expect to see some Midair Bobbing. The most common stock pose associated with this is the Levitating Lotus Position, although the Standard Powerup Pose can be seen as well. Contrast Ghostly Glide, when a form of this trope is used to unnerve. See also Chunky Updraft. And if the power of love causes it, it's Lovetation. Mother Dairy commercial called "Taste That Lifts You" shows people floating in the air when consuming the product. Upcider commercial Barfly shows people floating to the ceiling of a bar. Also in a laundromat , and over an apple orchard . A1 Internet commercial "Glasfaser Power" shows a woman floating in the air. Coke Light commercial has Sarah Jessica Parker floating in the air due to the lightness of the drink. Lipton Green Tea & White Tea commercial shows three women sipping tea which makes them float in the air due to its "incredible light taste". Pizza Etang ad has a group of young people floating in the air while eating pizza. Eureka Vacuum ad shows a woman floating and pushing a vacuum that "sweeps you off your feet". Metamucil ad shows a woman floating above a beach. Oxfam commercial shows how to give people a lift. Carte Noire commercial shows a couple floating in an airport lounge. Singha Light beer is so light it makes people float in their commercial . It first appeared in the original Dragon Ball with Tenshinhan, who alongside Chiaotzu are the first depicted using the technique in the series. Longtime fans of the Z portion can be caught off-guard when Roshi dismisses it as nonsense in the English dub. In Dragon Ball Z, all of the main characters can fly. When someone brings out their Super Saiyan Battle Aura, it adds to the mix rising currents of Dramatic Wind and Chunky Updraft lifting stuff up around them as they leave the ground. As an added bonus, this often happened not by having characters rise off the ground, but by having a small section of the ground blown out from under them with their Battle Aura. They simply couldn't be bothered to fall a measly four inches. Played with in Ah! My Goddess. All the paranormal types can and do float on occasion; however most of these (e.g. Belldandy) aren't especially menacing. Grove from Vampire Hunter D Bloodlust. When the others need him to, he uses a super powerful spirit form that glows and floats as he attacks. It's quite deadly. In Mahou Sensei Negima!, it's expected that wizards are to fly using wands or brooms, but at the particularly high levels, anyone may float in the air without any assistance. (Konoka, Nagi and Fate; Evangeline didn't count, for being a vampire with assumed flight ability). It was even used as a secondary clue that Fate was a high-level opponent ("and, y'know, he's floating"). In Magical Girl Lyrical Nanoha, the forced transformations of Hayate and Vivio into their respective Superpowered Evil Sides were both preceded by their bodies floating in mid-air while surrounded with their overflowing magical energies. Not to mention that pretty much the entire cast list of A's seems to have no problem with standing in thin air. It's like gravity doesn't want to pick a fight with any of them. Bleach justifies the trope with characters' "spiritual power" and the "spirit particles" that permeate the world. Those with enough spiritual power to be notable fighters are also powerful enough to condense spirit particles into invisible platforms, effectively standing on air. There's plenty of Roof Hopping and Le Parkour, but no actual flight; muscular effort is always required. Then the Big Bad is shown hovering in midair above Konoha prior to unleashing his ultimate jutsu. Oh, Crap!. Later, it seems like the Tsuchikage had the trope going on, but it turns out that he actually knows a technique that lets him and his subordinates fly. Unlike his reverb effect, Masami Eiri does not float in his first appearance in Serial Experiments Lain but does for most of the rest of the series. Natsume/Sabrina from Pokémon, more so in the anime than (her illustrations in) the games. Kaworu Nagisa from Neon Genesis Evangelion. Kyubey picks this up in Puella Magi Oriko Magica. Because he wasn't creepy enough already. Shiki, the Big Bad of the tenth movie, has this as a power. In addition to being able to float himself, he can make battleships or islands float... or just let them fall. Doflamingo has an interesting variation: his powers allow him to create razor-sharp strings, but he uses them to keep himself afloat during serious fights. Lord Kuruku from Unico in the Island of Magic floats all the time. Present in all versions of Sailor Moon. In the 90s Anime, most villains seem to prefer floating mid-air, often in lounging poses, when observing, appearing or gloating. In the manga and Crystal, the Senshi often float and/or fly themselves. Jojos Bizarre Adventure: When Jotaro and Dio were comparing attack rushes, they eventually just floated off into the sky on pure stand power, shortly afterward gaining the ability to fly Superman-style through the streets of Cairo. This ability disappeared after the battle in question and was never mentioned again. My Hero Academia: One of the Quirks stolen by All For One was 'Air Walk', which allowed him to do this. Superman does so once he suits up and readies for battle. In War World all heroes—Superman, Supergirl, Martian Manhunter, The Spectre—levitate at some point. During Kryptonite Nevermore, Superman hovers over the ocean while he tries to figure out how to stop a volcano while his powers are acting up. Supergirl does it constantly when she is about to fight. Their counterparts Bizarro and Bizarrogirl also are able to float and levitate. Dr. Manhattan does it in Watchmen. In the surreal 1989-1990 Larry Hama comic Nth Man: The Ultimate Ninja , the Reality Warper Alphie O'Meagan floats off his bed the first time he truly activates his power, after having a conversation with his subconscious in the form of a giant animated face coming out of his ceiling. Many powerful mutants in the X-Men are able to levitate, but usually there is a concrete reason besides sheer badassery. Storm, for example, can control the weather (and therefore could do neat things with the air around her to hold her aloft). Magneto's costume is (sometimes) made of metal, though it's explained when it's introduced (fun fact: neither Magneto nor Polaris could fly until Chris Claremont came along) that just as Polaris manipulated Earth's magnetic field to get rid of Krakoa, it can be used on a much smaller scale for single-person levitation. However, there are many Big Bad class X-villains who are seen flying, even when the other powers they use don't suggest they should be able to. Teen Titans Raven and Starfire often did this when accessing their powers or engaging in battle. Black Adam has a tendency to float a few inches above the ground. Such a frequent tendency that he apparently even does it when there's no particular need to be intimidating. Lampshaded when an ally asks him to stop doing it because of how disconcerting it is. The Sandman also mentions that angels never touch the ground, with the exception of the fallen angel Lucifer of course. When Remiel is forced to take over Hell, after much pleading and whimpering, he is also forced to land. Doctor Strange can hover unaided and likes to meditate in a Levitating Lotus Position. His Cloak of Levitation enables him to fly. The elite warriors of the most powerful faction in Universal War One float thanks to miniaturised anti-gravity devices. While Wiccan of the Young Avengers is perfectly capable of flight, when casting spells he tends to start floating and glowing blue. Ultimate Spider-Man: The first sight of the mutated Norman Osbourne, in full control of his power, gave this ominous feel. Ultimate Galactus Trilogy: Jean Grey levitates while she takes down the door bunker all by herself, thanks to her Phoenix power. Thousand Shinji: Shinji ends up using this. He used his telekinesis to float when he fought Kaworu, and during the Final Battle he and his Humongous Mecha were floating in the center of a storm of energy summoned by him. Downplayed in Advice and Trust. When Rei is arguing with Kaworu, she taps her power subconsciously, and her clothes ruffle despite the lack of wind. Children of an Elder God: After stealing the powers from the Elder Gods, Yui floats when she uses her power. In Neon Genesis Evangelion: Genocide, the nineteenth Angel was able to float. After spending almost all the story as The Ghost, Magneto makes his first Dynamic Entry in Child of the Storm floating in mid-air. RainbowDoubleDash's Lunaverse: Corona first appears using her powers to hover in mid-air without using her wings. The Humane Six when they transform, with Pinkie even describing it as "floaty". At the end, Twilight Sparkle floats too as she unleashes the magic. Unlike the above, it's not a pleasant experience and she looks quite distressed. And then Sunset Shimmer floats too at the start of her Transformation Sequence. In Lord of Illusions, the Evil Sorcerer Nix uses his powers to levitate and walk through the air several times, including standing on top of a near-bottomless chasm while holding one of his victims. This is part of Jean Grey's powers. Her telekinesis allows her to make any object float, including her own body. Storm can fly through wind manipulation. 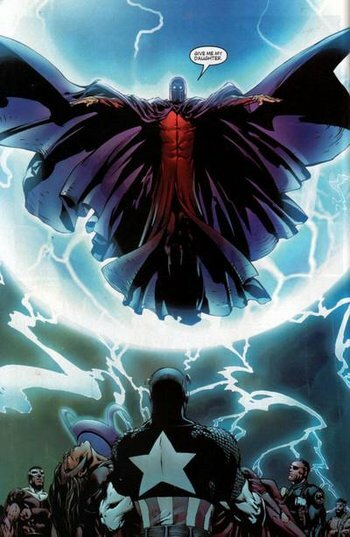 Magneto can fly by manipulating the Earth's magnetic field. In the short film Musik in der Luft (Music in the Air), the power of the classical music played by The Philharmonics enables many people to float in the air around Vienna, Austria. In the film Der Var Engang En Dreng (Skymaster, A Flying Family Fairytale), the mother, played by Anne-Grethe Bjarup Riis, floats in the air while singing "Jeg Vil Have en Baby". In the film The Bliss of Mrs Blossom, a group of beauty pageant contestants float toward the ceiling when their breasts are enlarged by a "unique gaseous substance". In the short film This Guy Is Falling, gravity is deactivated by the push of a button on a car dashboard, causing many people to float in the air. In the short film Helium Man, a young man floats in the air after breathing helium. Lo Pan in Big Trouble in Little China does this when transformed from an ancient old man to a relatively spritely (if incorporeal} version of himself. A saintly power in Jasminum, but the saint needs to concentrate on himself very hard to do this, which might be Irony. In Mary Poppins, Uncle Albert, then Bert, then the children, float to the ceiling and have a tea party in mid air due to being filled with Laughing Gas. Mary joins them in the air, without laughing, using her own ability to fly. Also see Contagious Laughter. In Harry Potter and the Half-Blood Prince, drifting eerily up into the air is the first sign that a student has touched a seriously cursed Artifact of Death. And then the screaming starts. In Harry Potter and the Deathly Hallows we learn that Voldemort has invented a way to fly without a Flying Broomstick or other aid, a feat previously thought impossible. In Stephen King's The Stand, Randall Flagg likes to spend his downtime hovering and meditating on his own awesomeness. The first sign of his Villainous Breakdown which begins after Nadine kills herself and his unborn child is that he can only hover a few inches, and not for very long at that. Just before the final fight in Thief of Time, Newgate/Jeremy floats gently, while glowing. He's learned Rule One — "Never act incautiously when facing a small wrinkly bald smiling old man!" Still doesn't go too well for him. Ravenor. Stephen Hawking plus psychic powers in a floating wheelchair. It's a relatively simple matter for a mage in The Black Magician Trilogy to levitate around, although Dannyl lampshades the trope by poking gentle fun at colleagues who can't be bothered to walk up staircases normally. Gale flies by manipulating the air around her. Aether floats by becoming incorporeal. Violet floats by lowering her density to that of lower than air. Mary and Globe can't levitate themselves but they can ride an object they're lifting telekinetically. Alice flies by subconsciously manipulating gravity. This is something she learns later, as she'd always assumed that flying was her power. Willow of Buffy the Vampire Slayer during her attempt to take revenge on Glory and later on when she seeks vengeance against Warren. The Gentlemen in "Hush" hover and glide a few inches off the floor, considerably upping their creep factor. Doctor Who: The Doctor does this at the end of the third series, post revamp. During the Ninth Doctor's run, a Dalek does this to overcome a flight of stairs, after the people it was pursuing assumed it couldn't climb stairs and stopped to gloat at their good fortune. The opening credits for Teen Wolf in season three show Scott hovering, apparently intentionally invoking this trope to clue the audience in on his growing power as a werewolf. Specifically, his transformation into a "true Alpha." Angel. In "Birthday", Cordelia has to become part-demon to handle her visions. She wakes up and is delighted to discover she doesn't have horns and a tail. She then has a vision, which she casually describes without any of the usual pain and passing out. Our heroes all gape in amazement...because Cordelia is floating in mid-air. In the Brazilian TV Series Os Mutantes, several characters (mainly Tatiana and Chris) have the power to make people (or themselves) float in the air. Tatiana's power usually involves strangulation as well. In the season 2 finale of Stranger Things, as El is expending maximum psychic effort to contain the Big Bad she begins to float off the ground. One of Phoebe's main powers in Charmed is levitation, and she uses it to kick asses to great effect. Whitelighters (including hybrids like Paige), some Demons and a few other magical creatures have similar powers too. In Black Lightning, when Jennifer's electrical powers start manifesting, her sister finds her floating above her bed. Eventually, she learns to float consciously and even fly when necessary. Older Than Print: Christian folklore holds it that angels constantly float, even when not actually flying, as their feet are never to touch base earth. Quite a few saints levitated or outright flew, so much that it has its own article on The Other Wiki. St. Joseph of Cupertino is the most well-known. Dark Eldar Haemonculi go in for this in a big way too, though in their case they have to rely on high-tech suspensor crystals to do the job. They find it a fitting tribute to their own monstrous egos that they don't have to walk like their inferiors. In Warhammer, the Slann are huge frog-like creatures, lords of the Lizardmen and some of the most powerful wizards in the world. They get around by sitting on rock thrones that hover a few metres above the ground. It is left unclear as to whether this hovering comes from lost technology or their magical powers. Many other wizards also get in on the act. A good number of wizard miniatures exist that are sculpted to appear as if they float above the ground, particularly among the Elves. Chaos Lord Sigvald The Magnificent, The Beloved Son of Slaanesh, was granted this power by his patron god, so that he wouldn't have to profane himself with touching the ground. The Elocater Prestige Class's 1st class ability, "scorn earth," causes you to float a foot off the ground at all times. The ability's description implies that you're so powerful, you've just decided to ignore the ground entirely. In fact it lets you float as high as you like, but at more than 1 foot above the nearest flat surface they lose a lot of speed and stability. Still, nothing is stopping you from floating up to the tower's topmost window and gliding through. Forgotten Realms has this included in most cases of Power High. The old Mystrylan ceremony of Starflight did this separately... but was often combined with Magefire cleansing ritual into one long Power High trip. Justified in gameplay: when magical flight becomes readily available at the early mid-levels, marking a threshold where Linear Warriors, Quadratic Wizards comes in full force, Squishy Wizards and other varieties of Glass Cannon have no business on the ground. Referenced in Pathfinder's Golarion setting with the Magocracy of Nex: buildings like the Spire of Nex have no staircases, on the basis that people who can't even cast a simple Fly spell have no business being there in the first place. The Ashura of Legend of the Five Rings appear to be samurai with moth wings that float above the ground. Although they are powerful, they aren't deliberately floating — they are so utterly corrupt that the earth itself repels them. The Iron Kingdoms has Harbringer of Menoth, who acts as the god's personal direct vessel for action in the world, is so pumped full of divine power that she is too holy to touch the ground. Sadly for her, said power cannot quite steer , so she is guided around the battlefield by a group of men who keep her tethered with sanctified chains. "So if you care to find me, look to the western sky! Tell them how I am DEFYING GRAVITY! I'm flying high—defying gravity, and soon I'll match them in renown. EVER GOING TO BRING ME DOWN! BIONICLE: When Brutaka fell into the Antidermis pool and soaked up the spirits of the unborn Makuta, he gained instant powers and super-knowledge. For the remainder of the story, he floated. The first of the flight powers is "hover", but it's essentially extremely slow flight. Well, it used to be only that. Recently, it was changed so that instead of just being in the "superman" pose but going comically slow, the character remains upright, with arms held out to the sides. It looks much more badass. And, of course, it can be used to invoke the trope: a very high level, powerful character who suddenly starts hovering above the ground can be, depending upon what they're saying, a visual shorthand for "you REALLY should be respecting me more" to "don't worry about it, I'll clear the entire map." There is also the Soul Storm power, which will raise the user into the air, flight or no flight. Soul Calibur IV: Algol perpetually hovers a few inches above the arena, surrounded by an ethereal blue aura. Only rarely does he ever touch the ground, during certain attack animations, or when he's been defeated. Bloody Roar 3: Uranus' pre-fight introduction has her float several feet above the arena, with her legs crossed and her hands clasped atop her knees, as though she's reclining in an invisible chair. She remains above the ground throughout the match and can levitate herself and her opponent higher during air combos. Yes, she's so broken that even the laws of gravity don't apply to her. As far as playable characters go, Mewtwo and Palutena float both while running and when using certain abilities, and Rosalina constantly floats a few inches above the ground. The first one is a very powerful psychic pokémon, and the other two are Physical Godesses. Final Bosses Master Hand, Crazy Hand, and Tabuu constantly float. Smash Balls, the items that grant the player a Final Smash, float all around the battlefield. Ansem-possessed Riku from the first game. Coupled with Riku's echo-y voice and new outfit, this just screamed that you were in for one hell of a fight. After Ansem kicks Riku out altogether, he spends pretty much all his time floating. In Kingdom Hearts II, this applies to two of Sora's Drive Forms. The magic-based Wisdom Form doesn't walk so much as magically slide along the ground. Final Form takes this further, as Sora is constantly levitating to illustrate the form's power. When you play as Xemnas in 358/2 Days he does not walk as the other characters do, but floats instead. Super Sonic and most of the other super characters. And Super Mecha Sonic at the end of Knuckles' run of Sonic & Knuckles. The way it floats is perfect Nightmare Fuel. There are plenty of characters who do this in the Tales Series, usually villains. Dhaos from Tales of Phantasia does this whenever he's moving, though he's always doing it in his final form. Miktran in the remake of Tales of Destiny does it both of his forms. Shizel from Tales of Eternia is another "only while moving" example. Colette from Tales of Symphonia provides a heroic example while in combat. Duke in the battle against him in Tales of Vesperia. Rita can also get in on the floating with her Levitate ability, though it rapidly expends TP while it's active, due to being able to levitate out of the reach of many enemies. Estelle does it in both of her Hi-Ougis, as well. Emeraude and Solomos from Tales of Graces. The gods of Soul Nomad & the World Eaters float. Effortlessly. All the time. You do not want to tangle with them. And The Sorrow from MGS3, although he is technically a ghost. While it's not really floating as much as it is slowing her fall, Justicar Samara from Mass Effect 2 can use her biotics to float herself through the air for short periods of time. Given that she can send hundreds of Collectors flying with some effort, she could probably support herself for a while. Why she would is another question. Mass Effect: Andromeda: Levelling up the Adept character profile (which grants bonuses for related skills rather than being the ironclad "class" they were in the original trilogy) will eventually cause Ryder to forego using their armour's jumpjet in favour of propelling themselves around with sheer biotic power. Meanwhile, kett Ascendants like to float about the battlefield, thanks to some eezo-related assistance. Bass/Forte. His trademark float is just one of those little things that make him even more badass. Granblue Fantasy: It's mentioned in the Wind version of Metera's first Fate Episode that Flight magic is incredibly advanced and that only the most proficient of users are able to fully fly freely; this is consistent with magic users like Niyon, Marquiares, and Tweyen being incredibly powerful and all flying unassisted. Your character levitates into the air while casting spells. Mursaat are constantly levitating. Mursaat are also near-godlike beings that can kill you by just being near you. Joshua at first appears to be just a white haired Bishōnen with a magic cell phone, and no real athletic prowess. However, about midway through his chapter, he reveals that he's actually much more powerful then he lets on. While in Levitate Mode, Joshua is arguably one of the most powerful partners in the game, and his Jesus Beams are much more powerful than his standard ground combo. Of course, it only makes sense that he can float because he is Shibuya's Composer. They don't call them Jesus Beams for nothing. Neku floats when he uses most Psychs that prevent him from moving during the attack. Examples include Pyrokinesis, Discharge, Psychokinesis, and Cracklepop Barrier. In Sword of Mana, when you finally get to fight Julius, he floats a few inches off the ground. This is before he actually goes One-Winged Angel, but then, his Vandole blood has basically taken him over by now, and he's also leeched most of the Mana Tree's power too. Dimentio of Super Paper Mario is only ever seen standing or floating, never walking. Characters casting high-level magic will rise to a foot or so off the ground for the duration of the spell. Magus, a powerful sorcerer, prefers to skim along just above the ground in a dramatic pose, since running is apparently for chumps. Dark Samus from Metroid Prime qualifies quite adequately, also displaying an ability for full-scale flight in the third game. Every time Samus got a new suit in Metroid Prime 1 and 2, she would rise into the air while glowing energy surrounded her and she equipped the suit. In Metroid Prime 3, this was reserved for when she released phazon into Leviathan cores, again glowing, but this time with phazon. Her Final Smash in Zero Suit form in Super Smash Bros. Brawl involves getting her Power Suit back (as well as dealing massive damage to anyone unlucky enough to be standing next to her during it), so it also has her floating as the suit's pieces form around her. Polvakian Gem Slugs in Startopia are so rich, lazy, and haughty that they loco-mote on hovering wheelchairs. The original Mortal Kombat has Sorcerer Shang Tsung floating just off the floor when you fight him, making sweeping attacks ineffective. The power also lies with other characters, most notably Ermac, a collection of souls, and Raiden, the Thunder God. Azure Kite very, very rarely walks, or even stands. He just floats two inches off the ground, even when you later get to recruit him into your party. None of the Avatars walk either; when an Epitaph User summons one, he appears to be floating (Avatars themselves are invisible to normal players). In Final Fantasy XI, float is forbidden magic, so only certain very bad, badass characters can actually float. This includes the Arcangel Tarutaru, Kam'lanaut, and Eald'narche. Not to be out done the Big Bad from the Wings of the Goddess expansion, Lady Lilith, is so badass that she can actually fly. On the good side, Selh'teus can fly because he bonded with the Terrestrial Avatar Phoenix. In Final Fantasy XIV your player character will float when casting some of the more powerful magics in the game. White Mages when casting Holy and Aero3, Astrologians when casting Gravity and Summoners when tapping into the power of Bahamut to cast Death Flare. In Dissidia Final Fantasy (2015), Shantotto spends a lot of her time floating in cutscenes. In Neverwinter Nights 2, anytime a high-level wizard or mage character casts a high-level spell, they levitate several a foot or so off the ground while performing the spell. The other two powers also occur, as the character gets a glow around them and the chants start to echo. In Mega Man X8, Lumine spends the entirety of his first battle phase floating around the battlefield in a figure eight pattern. In Touhou Hisoutensoku Yuyuko, Iku, Cirno, and Utsuho only ever touch the ground when crouching or knocked down. Of these, Cirno is a definite non-example, only being especially powerful by fairy standards. Utsuho is the strongest example, having no particular reason to float other than being badass. In the Valkyrie Profile games, the bonus character, Freya, is always floating off the ground, and is usually one of the most powerful people you can add to your party (or, similarly, one of the most powerful bosses you can face). Joachim Armster from Castlevania: Lament of Innocence. Stella and Loretta Lecarde from Portrait of Ruin. Soma Cruz in the Bad Ending of Dawn of Sorrow. Otani Yoshitsugu from Sengoku Basara sits in a floating palanquin and attacks with floating prayer beads he manipulates with his Mind over Matter powers. The only times he ever touches the ground is if you knock him down or kill him. While all the Deities in Asura's Wrath can fly, Karlow levitates on low ground, and can even flip upside down. The God of light Fortinbras from Onimusha: Dawn of Dreams. Not only has this as a basic powert, he can even Walk in the Air. In Jak and Daxter: The Precursor Legacy Gol Acheron and his sister Maia are only ever seen floating. Gol even has weights tied to his waist, probably to prevent him from drifting off. Neptunia: You'll never see a CPU or CPU Candidate actually using their feet when they've activated HDD. In The Last Story, anyone casting a spell will float for a few seconds. In Devil Survivor, you see Naoya doing this on routes where you fight him. Whether it's because of his powers or if it's just a reference to his preference for demons that have Flight, Devil Speed and Phantasma isn't certain. The High Templars float, leave glow-y afterimages as they move and echo while they speak. They are arguably the most powerful casters in the game and one the most powerful characters in the games' lore was one of them. Two High Templars can also merge and form an Archon, one of the absolutely most powerful units in the game, and adds a much deeper voice to the already impressive list of clue-ins concerning their powers. The expansion, Brood War, also adds the merged form of two Dark Templars; the Dark Archons, beings with powers so immense they can completely mindwipe any unit that gets in their way. Ulrezaj, another one of the grossly overpowered characters in the games' lore, is a Dark Archon formed by the merging of seven Dark Templars. He is closer to an Eldritch Abomination with the potential to invoke a Cosmic Horror Story more than he is a Protoss. In the sequel, the Hybrid Destroyers float all the time and are incredibly powerful being Protoss/Zerg hybrids that more closely take after their Protoss heritage. They're basically Protoss Templars on steroids. Background material reveals that extremely powerful human telepaths/telekinetics, like Kerrigan and Nova, are able to float by telekinetically lifting their own bodies. In her origin book, Nova does admit that requires a lot of concentration, while Kerrigan can only do it after becoming the Queen of Blades. Fans are still arguing over which of the two is the more powerful (the general consensus is that Nova is more powerful than pre-Zerg Kerrigan but is weaker than post-Zerg Kerrigan, and considering that Nova can emit a psychic blast more powerful than a nuke...). In Disney Princess Enchanted Journey, Zara does this to avoid fighting you directly. In Dark Souls II, two of the more dangerous bosses encountered, the Pursuer and the Darklurker, float all the time. Throughout the series and in the background lore, the ability to levitate is common among Tamriel's vampire bloodlines, with the exact details of the ability varying. In Morrowind, Vivec, one of the Dunmeri Tribunal deities, can be found floating in his temple. He most commonly floats in a Levitating Lotus Position. Dragon Priests, powerful undead mages who once led the Dragon Cults, float above the ground when they move. The Dawnguard DLC adds Pure-blooded vampires to the mix. Pure-bloods can transform into the Vampire Lord form, where they can either walk on the ground (using their powerful melee attacks) or hover ominously (where they can use their unique magic attacks). One of several shout outs to Big Trouble in Little China present in the first Mortal Kombat game, Shang Tsung is animated solely by Midair Bobbing, to demonstrate his power as the final boss, despite being ancient. In Shop Heroes, Mojian (one of the high-end characters) begins to levitate from time to time as a sort of Idle Animation. In Wario Land 3, Wolfenboss, the sorcerer fox boss of the Pool of Rain, is always floating out of the range of your regular attacks (Complete with Midair Bobbing when he moves), never touching the ground (Even when he is defeated, he just falls past it), while attacking you with powerful magic spells, specifically an energy ball that reflects off the walls and floor and levitates you out of the arena if it hits and a giant spiked ball that inflates you into Puffy Wario if it hits (Causing you to fly out of the arena) and provides the enemies needed to defeat him. He is usually considered one of, if not, the hardest boss in the game. Tales from the Borderlands uses this trope a few times, such as when the Gortys core is first assembled. The final instance is a Deconstructive Parody, however. At the height of the tear-jerking death scene resulting from one character's Heroic Sacrifice, the heroes discover that a seemingly innocuous item is actually a one-use resurrection device. As it restores the body to perfect health, it also raises it at least six feet off the ground—and then drops it like a stone when it's done, causing a fresh broken arm. Resurrectee: Why would something that's supposed to help me drop me like that? In Silhouette Mirage, Zohar and Geluve do this, the former always floating except when knocked down, and the later floating during and right after her boss battle, complete with lounging in mid-air while summoning her mooks to use as weapons against you. The Legend of Zelda: Ocarina of Time: After ascending from an Evil Sorcerer to a God-Emperor, Ganondorf gains the ability to levitate, most notably in his Final Boss fight with Link. The Big Bad Jack of Blades is the only character shown to levitate at will, which he does with a tentacular red and black Battle Aura. He's also a dreaded One-Man Army and a primordial Humanoid Abomination. When it's Time to Unlock More True Potential for the Hero through the power of his bloodline, he's swept up into the air in a haze of green light. Used by Amber, the Fall Maiden, in RWBY, once she is given reason to fully unleash her powers, throwing down her attacks from well above head level. Once Cinder gets the powers herself, she starts doing it too, though not always as high up, so it seems to be something inherent in the Maiden powers. In Sluggy Freelance, Gwynn tends to float and glow when she starts really channeling her witchy powers. The Way of the Metagamer. The Colour Drops all float, as do spellcasters when preparing spells. Magick Chicks has a scene where Melissa requests power from Genius Loci and receives a wand. After touching it, she is found unconscious, floating in midair inside a hamster-ball of force and whirl of sparkles. When the girl who fought her approached, she gets encased in another floating hamsterball. In El Goonish Shive, Grace can float when in her Omega form. This is justified as she floats using telekinesis and so far only in that form does she have enough power to levitate herself. In Anti-Heroes, Quentas the Psion is always floating above the ground, never bothering to walk. Our Little Adventure: Angelo Souballo, one half of the Big Bad Duumvirate and arguably the world's most powerful spellcaster, usually floats a few feet off the ground, even when preening at the bathroom mirror. What sets him apart from the spellcasters who use flight magic for tactical purposes is that, somehow, he doesn't need a spell to do it. The high-level wizard Vaarsuvius usually uses magical flight to get around. Justified since the spell in question lasts all day and is very tactically useful. The Big Bad Sorcerous Overlord Xykon also uses magical flight as a matter of course. Best exemplified when he single-handedly storms a fortress and when his flight path takes him through a castle wall without slowing down. Girl Genius: When Agatha drinks from the Dyne, the power causes her to float and gain glowing eyes. To hear Higgs tell it, she's lucky she didn't explode. She Dwarf: The enigmatic elf Drift is shown first as a No-Nonsense Nemesis with devastating magic powers and then as a Worthy Opponent willing to listen to reason. Then she soars off into the air. Hack: And, she flies. Of course she flies. In Phaeton this happens when Trayen hyperenergises, its stated that the sheer force of approaching elements lifts him off the ground, considering he is acrophobic he is very uncomfortable about this. Dr. Insano: You do realize you're just standing on your tippy-toes, don't you? How To Hero insists that simply floating in the air is one of the most powerful looks a superhero can have. Aang floats, makes his voice echo, and glows, although the tendency to float seems tied to using the Avatar State as Unstoppable Rage rather than Super Mode. Downplayed by Aang's Simple, yet Awesome airbending trick of balancing on a ball of air to hover or zip around, which cemented his Innocent Prodigy status and got him declared an Airbending Master at age ten. He developed it to goof off at the Air Temple, but during the show's run he made great use of its tactical applications. Power Floats is also an extremely rare Airbending technique, supposedly achieved by a man named Guru Laghima. The Legend of Korra Book 3 Big Bad Zaheer has seeking the secret to this trick as one of his primary objectives, and he succeeds when his beloved P'Li is killed in the second to last episode of the book, severing any and all earthly desires he has. Ron floats and glows when he taps into his inner monkey in the real Kim Possible finale. The Venture Bros. has wizard Dr. Orpheus, who often levitates for no reason at all. W.I.T.C.H. : The Heart of Kandrakar is often seen floating, usually above (or between) Will's hand(s). It's also got the glowing effect down pat. The villain of Princess Gwenevere and the Jewel Riders, Lady Kale, once managed to take over most of the magic in Avalon and rule the kingdom. When the Jewel Riders broke into the Crystal Palace, they found her at Queen Anya's throne — or more specifically, "sitting" on it by floating high above. The Rooster Talisman in Jackie Chan Adventures grants the user levitation and telekinesis. Anyone using it ends up floating pretty much constantly. Other characters also invoke the trope on occasion too, such as Tso Lan the Moon Demon Sorcerer and Drago in the series finale after he acquires all of the Demon Chi powers. In My Little Pony: Friendship Is Magic, Twilight Sparkle and her friends hover above the ground whenever they harness the Elements of Harmony, and in the Season 4 finale, the Rainbow Power, which also gives the non-winged Mane Six members full flight ability. All of the ghosts in Danny Phantom both float and have a glowing aura. Dawn is shown to levitate as seen in the first episode of Total Drama Revenge Of The Island, which also scares Mike. Star Butterfly in the season 2 premier of Star vs. the Forces of Evil has to "dip down" and use magic on her own, without the help of a Magic Wand. In addition to creating a blue aura and causing her eyes and hearts to glow bright blue, this results in her levitating about 20 feet in the air. Marceline of Adventure Time rarely walks a good majority of the time, pretty much floating everywhere. At first it's thought to be a part of her vampric powers and it is, in a sense. As the mini-series, "Stakes", shows, she got it from the first vampire leader she killed and inadvertently sucked up his essence due to her demon powers. After which she was granted flight, so when the essence escaped and reformed into said leader, she lost the power till she killed him again. However, it's all a matter of image since, according to the same man, an unarmed man has absolutely no chance to prevail in a fight against an adult wolf, especially if said wolf is a female with cubs. Though some combat martial arts taught to special forces and commandos include techniques for use against guard dogs; these ones are useful against wolves, too. Alligator tend to be afraid of humans too, at least on land, since their low-set eyes mean that all they see are a pair of huge legs. But they will attack if bothered, and if humans feed them, then they lose their fear, which is why it's illegal to feed wild 'gators in South Carolina and Florida (but not Louisiana for some reason).